I used to think oatmeal was just a cozy wintertime breakfast. Silly me. That was before I met overnight oats – the creamy, cool, refreshing creation that is truly summer’s version of breakfast comfort food. 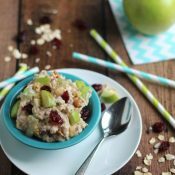 And once I tasted Gretchen’s Overnight Oats with Apples, Cranberries and Cinnamon … well, I was crave-crazy, head-over-heels in love with the idea. I took her recipe and ran with it. I ran and ran (we’re practically talking an overnight oats marathon here, I ran so much with that idea) … and all last summer, I made up my own variations based on whatever I had in the fridge. This blueberry-almond version was, hands-down, one of my family’s favorites. We made it all summer long last year, and we’ve already made it several times this season, too! 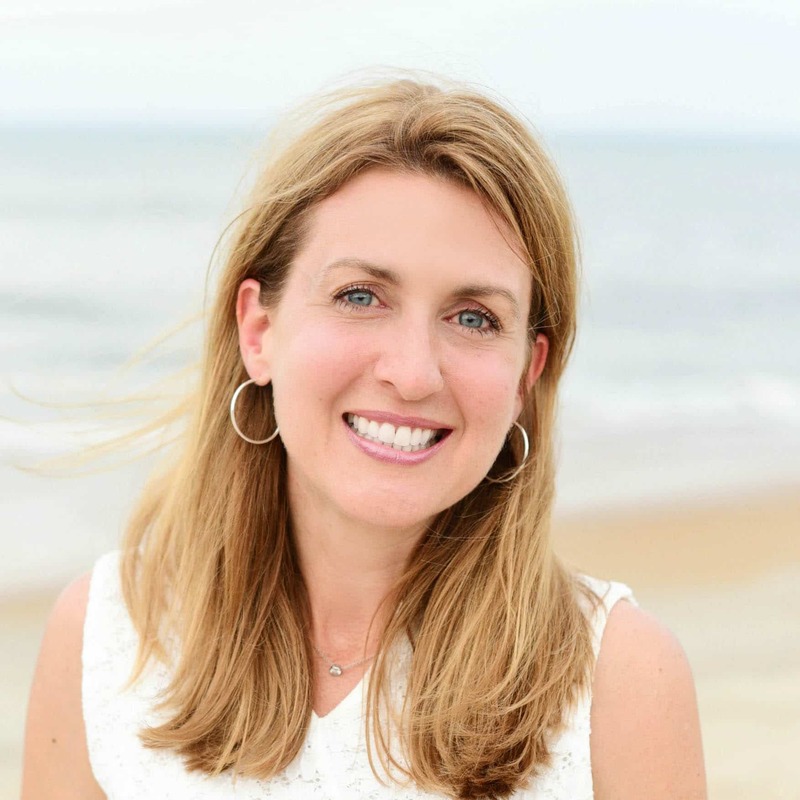 Trust me – once you try this, you’ll know exactly why! It’s rich and satisfying, yet refreshingly cool and light. 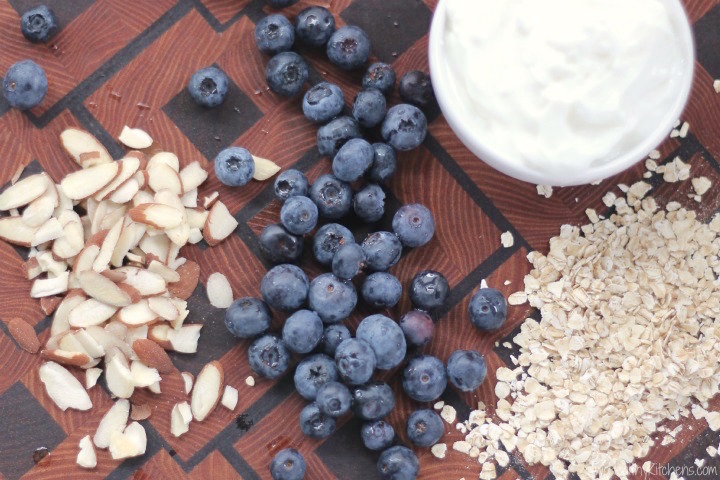 Plump blueberries and crunchy almonds, creamy vanilla yogurt and just a hint of cinnamon. Mmmmmm … perfect for summer! 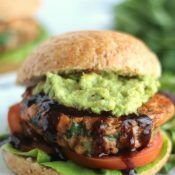 It’s got the keep-you-filled-up-and-going-strong combination of fiber and protein, but it won’t weigh you down. You’ll be out the door in a flash – fueled up and ready for summertime adventures! And isn’t that just exactly the kind of breakfast you need in the summer? Light but filling. Quick but delicious. Easy but satisfying. Yup. Gotta love overnight oats! But here’s the thing about me … and summer. I’m pretty terrible at remembering to make breakfast the night before (so it’s all nice and ready to go in the morning). I love the idea. But somehow, in the summer, I don’t quite get it done. We’re usually out, sitting by the fire pit with neighbors, while the kiddos all play “night games” … and somehow it gets very late and I forget all about my brilliant plan to prep breakfast for the next day. So, last summer, I kept finding myself in a bit of a pickle. I was totally craving overnight oats, but I kept dropping the ball on the plan-ahead, overnight part. Harrumph. Gretchen? She’s an overnight oats girl all the way. She plans ahead. Preps the night before. Wakes up to a ready-to-go breakfast. Slam dunk. But not to worry! 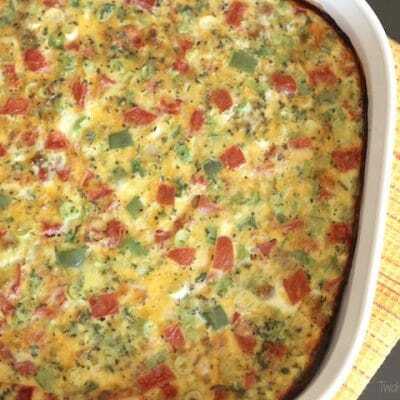 If you’re like me, and maybe didn’t quite get around to making a breakfast plan 12 hours in advance (because the fire pit and fun neighbors and kick-the-can and capture the flag all just sort of … happened …) well, I’ve got ya covered! I constantly have to tweak my recipes for overnight oats, so they’re more like instant, “it’s-morning-and-mommy-didn’t-plan-ahead-and-we-need-a-quick-breakfast” oats. Works perfectly, I promise! 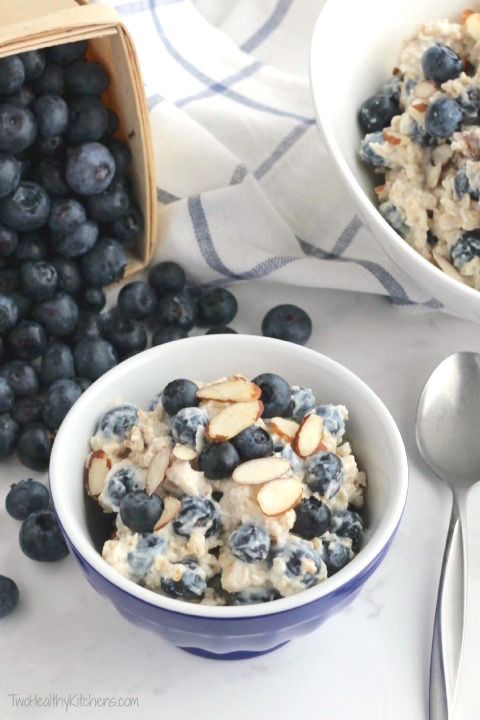 Although all you pre-planners out there (ahem … Gretchen) can make this delicious concoction of creamy blueberry oats as a make-ahead, overnight breakfast recipe, you can also just whip it up in 5 minutes in the morning. Like when you realize it’s breakfast time and you don’t have a plan (ahem … me)! 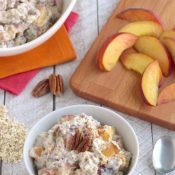 And you’ve got a perfect, delicious, overnight oats recipe … that you don’t even have to make overnight (wink, wink)! In a medium bowl, combine yogurt, milk, brown sugar, almond extract, cinnamon, and salt, stirring with a whisk to combine thoroughly. Add oats, almonds, and coconut, stirring again to combine. 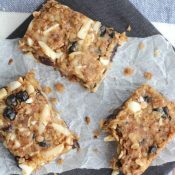 Allow oats mixture to sit for a minute or two before serving, if needed, to allow oats to soften and mixture to thicken. Directions for Overnight Oats version: If you'd like to make this recipe ahead of time or the night before, increase the amount of milk to ⅔ cup. 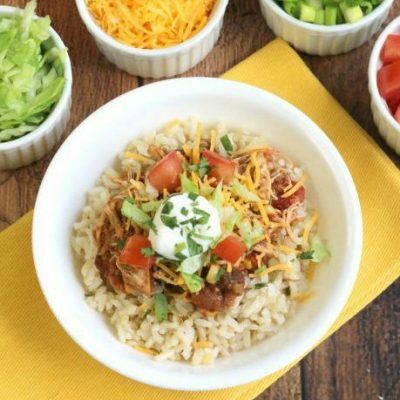 Also, be sure to use old fashioned, rolled oats instead of quick oats. Quick oats aren't hearty enough to withstand overnight refrigeration, and they'll be a bit too thick and gummy by morning. 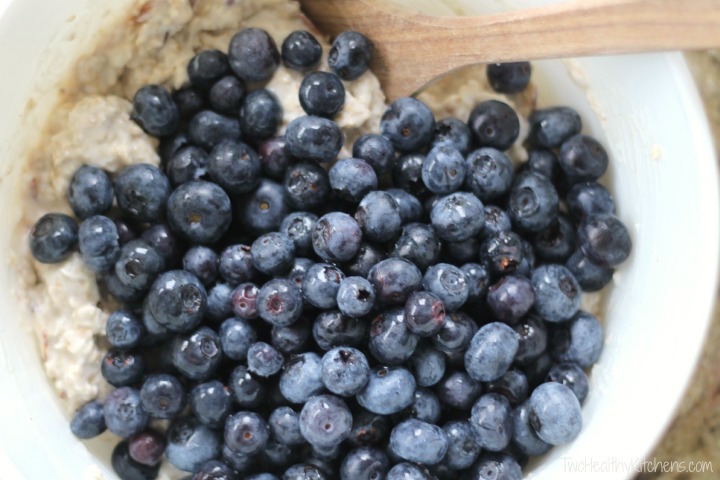 After mixing the ingredients together, cover your Overnight Oats and refrigerate several hours or overnight. Brown sugar: Different brands of vanilla Greek yogurt vary significantly in the amount of sugar they contain and how sweet or tart they taste, which can cause variances in how much brown sugar you’ll want to add to this recipe. We recommend starting with 2 tablespoons of brown sugar, and adding an extra ½ tablespoon on sugar only if needed. 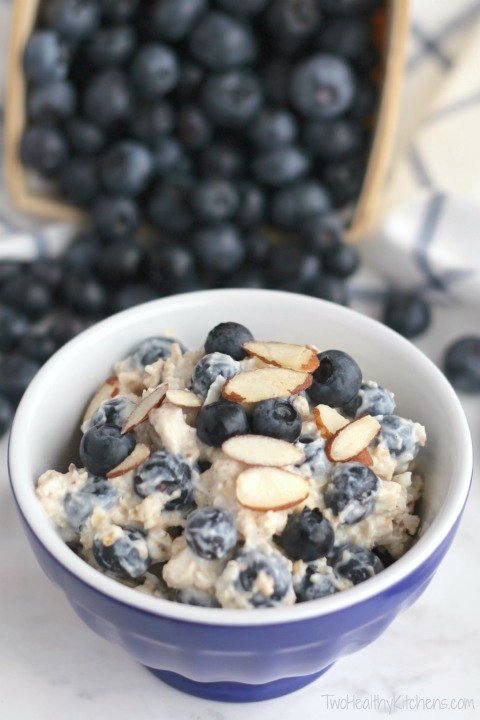 How many serving as calories is 1 serving of overnight blueberry almond oatmeal? As I sit here eating this oatmeal for breakfast today, I thought I just had to send you a comment on how awesome it is! I have made it so many times since you first posted it, as you know and with some borrowed ingredients from you, to the “T” and since, with a few variations due to the things I keep in my fridge (plain Greek yogurt, unsweetened vanilla almond milk, unsweetened coconut) and it is still so incredibly yummy I feel like I can eat it for dessert! 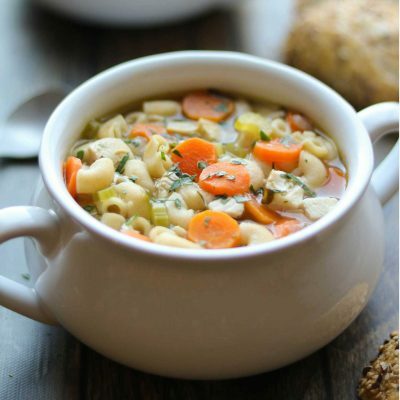 I feel I can really never go wrong with any of the recipes posted here – thank you!! I’ve been wanting to try overnight oats but most of the time I lack the skills to do anything in advance. It’s good to know I don’t have to worry about that anymore! 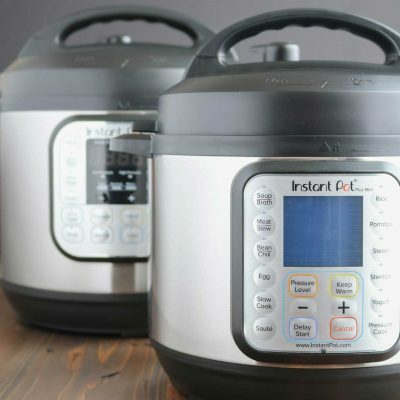 They look absolutely delicious and I can’t wait to give them a try. Looks exactly like my sort of cereal with lots of interesting flavors and textures! This sounds delicious! I’d love to make it, but I don’t like yogurt. Could I substitute extra milk? Hi, Sue! That’s a really good question, and I’ll be totally honest in telling you that, although I’ve tested this recipe numerous times with various amounts and ingredients, I’ve never tried it without yogurt. We love the creamy texture and big, keep-you-full protein boost of Greek yogurt, plus all the great probiotics. You may find that the yogurt doesn’t bother you in this recipe, especially if it’s the tanginess that you don’t normally like – because we use vanilla Greek yogurt and layer it with lots of other flavors, there isn’t that tell-tale tang you might get if using plain Greek yogurt. Having said that, though, if yogurt just really isn’t your thing, I definitely think you can (and should!) 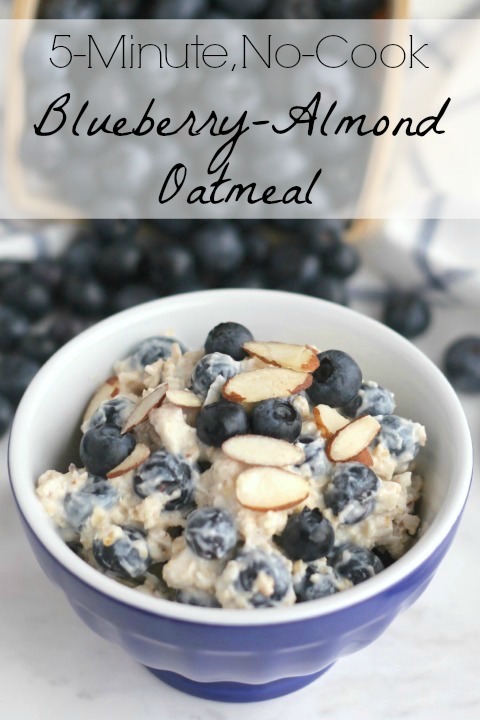 try this oatmeal recipe in a way that works better for you. It’s just waaaaaay to good not to give it a shot! You’ll definitely need to make some adjustments, though – for example, you’ll need to account for the fact that you’ll be missing some of the sweetness and vanilla flavor that the vanilla Greek yogurt gives, and, without testing this personally, I also can’t tell you exactly how much milk you’ll need in order to yield a similarly lovely, creamy texture. I did some Googling this morning and have some ideas that might help if you’d like to give it a try. 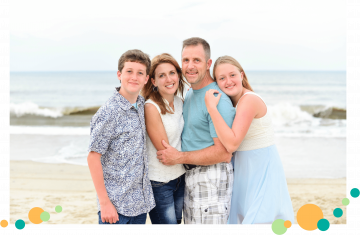 For example, Tammy of Organize Yourself Skinny says that, when making overnight oats without yogurt, she likes to use the proportion of 1/2 cup rolled oats to 1/2 cup liquid. 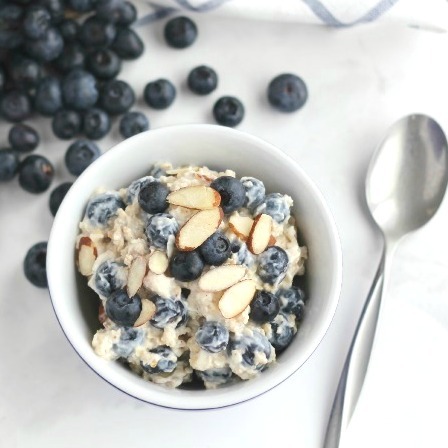 So, for our Blueberry-Almond Oats recipe, which calls for 1 cup of oats, you might try starting with 1 cup of milk. 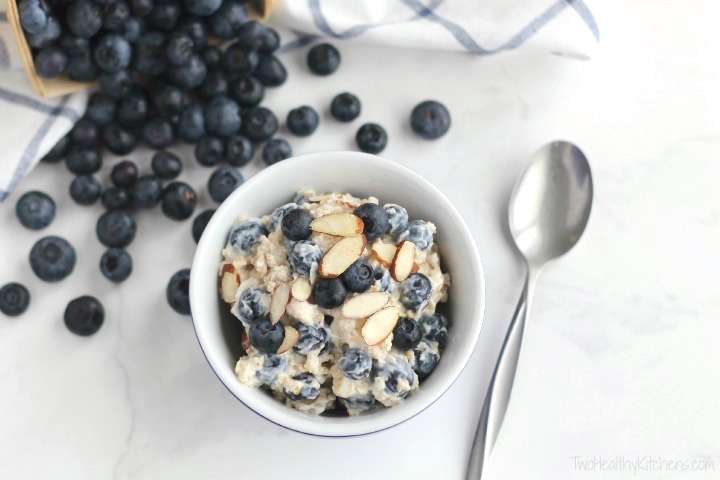 You might also take a peek at Skinnytaste’s Skinny Overnight Oats in a Jar recipe – besides the fact that she doesn’t use yogurt in this overnight oats recipe, Gina includes chia seeds, which gel a bit and may help you get a pudding-like, creamy texture. 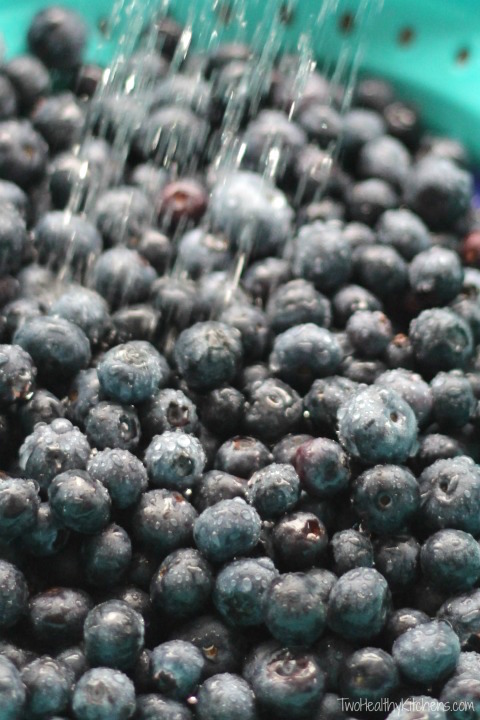 Grace of Double Thyme uses this technique, too, allowing the chia to plump and soften overnight in her Blueberry Chia Overnight Oats. Chia Pudding is really popular right now, and it might be fun to try that as part of your strategy for adapting this overnight oats recipe!